Profile page is where you save the basic and detailed information about your parking page. This is important because it will become the Meta Data for your parking page that is not only used by your visitors, but also by search engines to index in the search results. So we strongly recommend you fill in this page. On this page, you will be able to also upload a favicon and a logo and save any social media accounts which will be displayed on the parking page's homepage for your visitors to interact with. An important setting within this page is Page Type. There are 3 types of pages available - Monetization, Sale and Contact. Monetization page lists advertising items that you add via Monetization settings. As the name suggests, this type of page is purely for monetizing your domain name quickly and simply, without other elements. If your primary goal is to sell your domain, then you will need to select Sale type. 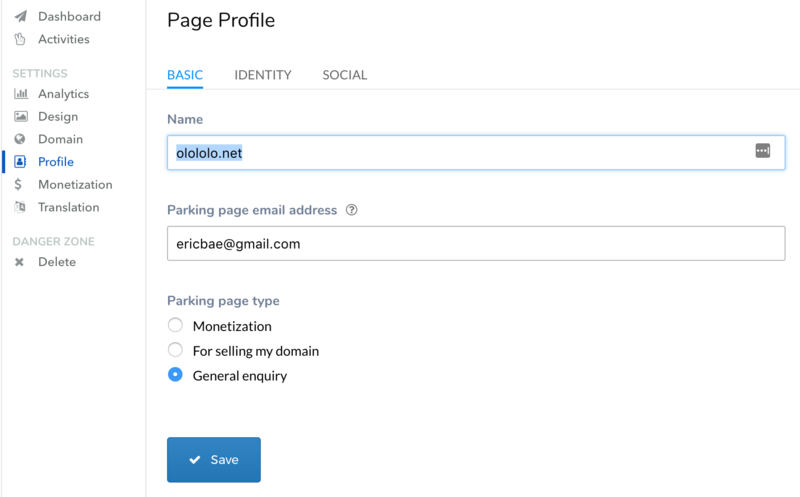 In this page, visitors will see a form where they will fill out details if they are interested in buying your domain name. Lastly, Contact page is similar to the sales page, but it is for capturing all types of enquiries about your domain.